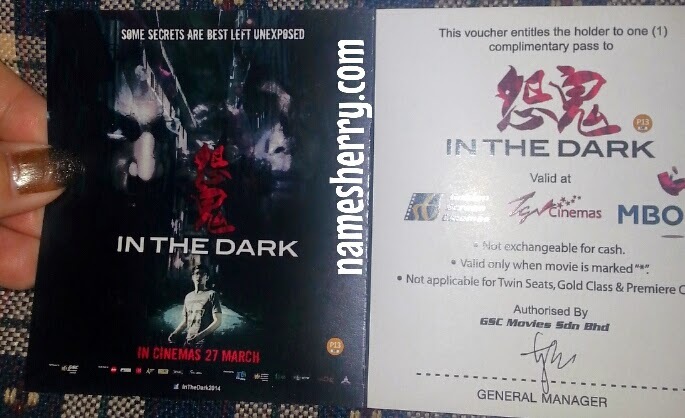 Today is the lay I picked to go for movie, yeah I watched In The Dark (mandarin ) Movie. It is awesome movie about ghost and love story. It's a romance movie you don't want to miss out, a real estate agent fall in love with a gal she just met from the flat that he supposed to rent it out. The gal he fall in love, had a car accident with another guy in the car. A lorry hit their car from the back. Many things happened when he and her girlfriend's friend named Vivien started playing the Chinese words of paper. It was his idea that he wants to see her ghost girlfriend again. Vivien and his girlfriend working as Piano teachers in a centre. One of their student's suicide due to pressure as she has repeated piano lesson of same songs for two months, she couldn't take it anymore. She beg the teacher Vivien to teach her new song to play. Vivien was a replacement teacher for a day to the gal. She couldn't believe that she's going to suicide, she just wants the best for her by asking her to practice and remember what she had taught. The gal told her that her mom would hate her if she failed again. What's next? It's better you watch in cinema to find out more. It's a touching story, and yes I got scared in the movie too! The movie is rated PG13, I saw a couple bring their children to watch the movie. Frankly speaking I learn piano before, and I would say it is tough. It's not easy to pass the test too. I wouldn't know that it's very pressure to some children until I watch the movie. It maybe extra activities for children, still we don't want to pressure them. Just give let them enjoy and have fun! Is the movie really scary? ?